There’s something about baking in the morning in the summer. Something about the quiet. The gentle sunlight. The way that puttering around the kitchen gives me a sense of purposeful ease. There’s a tactile pleasure in it. And a tangible satisfaction in feeling like I’ve accomplished something so early, which lets me off the hook for the rest of the day. 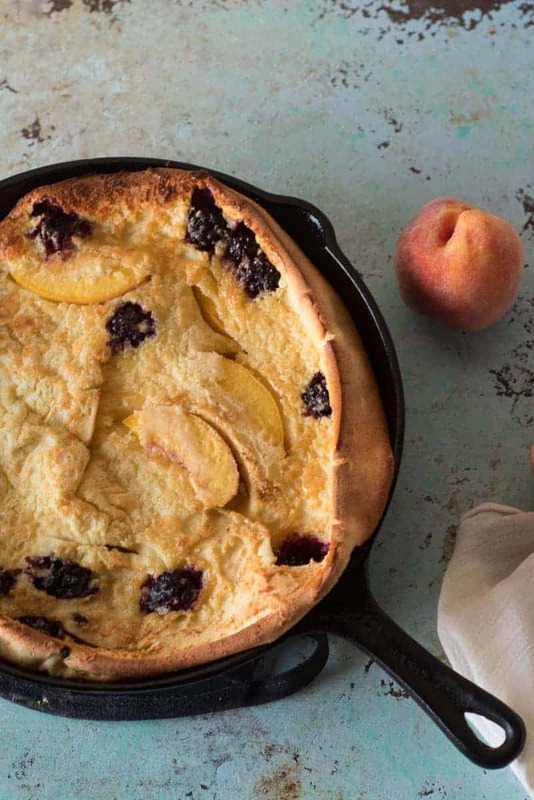 Enter the blackberry peach Dutch baby. I love the combination of blackberries and peaches. Deep purple berries bright with acidity and yellow-orange peaches that bring their sweet nectar to the party. It’s a combination I’ve often enjoyed in the fantastic bread pudding at M. Henry, a brunch spot in our neighborhood, and this blackberry peach Dutch baby is a bit like a lighter, easier version of that breakfast treat. I have a soft spot for Dutch babies, which are sometimes called oven pancakes or Dutch baby bunnies or German pancakes. Whatever you call them, they’re one of the simplest ways to make a spectacular brunch. 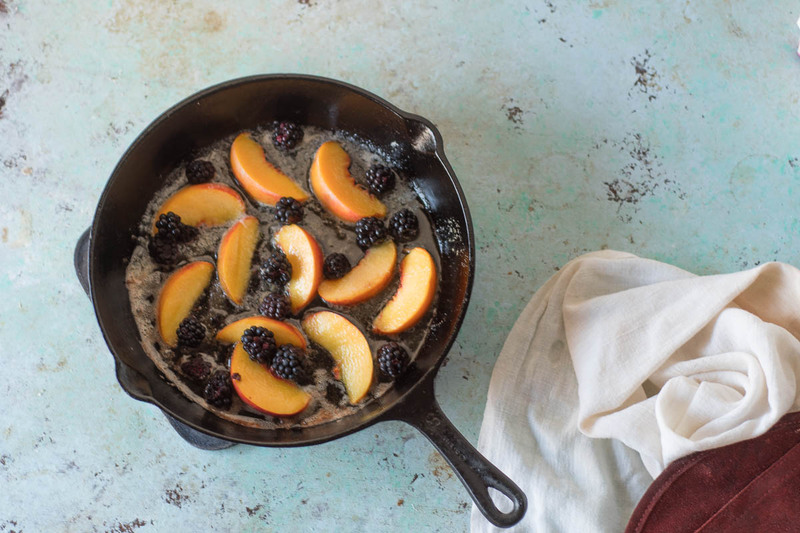 Heat the oven, melt some butter in a cast iron skillet, add some blackberries and sliced peaches and let them just barely saute on the stove while you blend eggs and flour and milk until frothy. Then pour the batter over the fruit in the skillet, gently slide it into the oven, and wait for it to puff and turn golden. Then watch it slump back down into the pan after it comes out of the oven. Dutch babies are incredibly flexible. In the fall I often make them with apples, in winter I make a mean cranberry Dutch baby, and at other times of year I reach for whatever fruit is in season (or keeps well in the freezer). They barely need any adornment, but I usually pour a little maple syrup over them anyway. They’re also delightful dusted with powdered sugar. Really, they just need to be sliced and served. 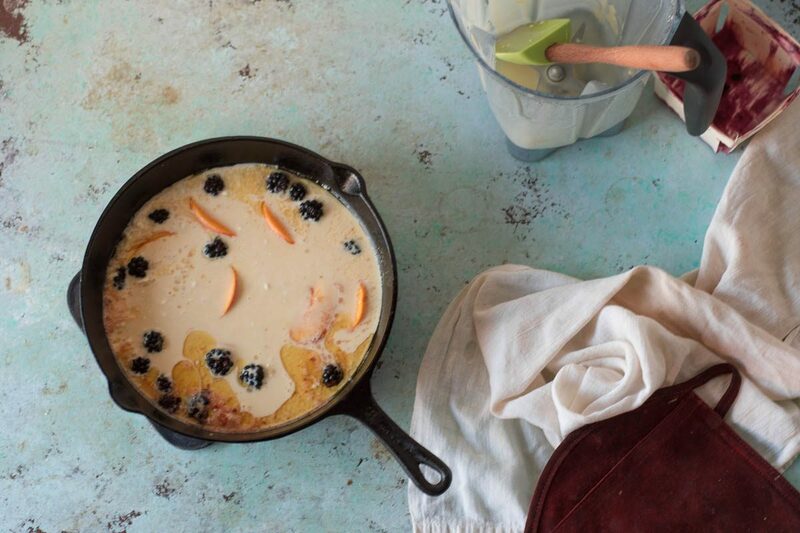 This Dutch baby is a puffy, eggy oven pancake. It works best in an 8 or 10-inch cast iron skillet, but will work in any similarly sized oven-safe skillet. 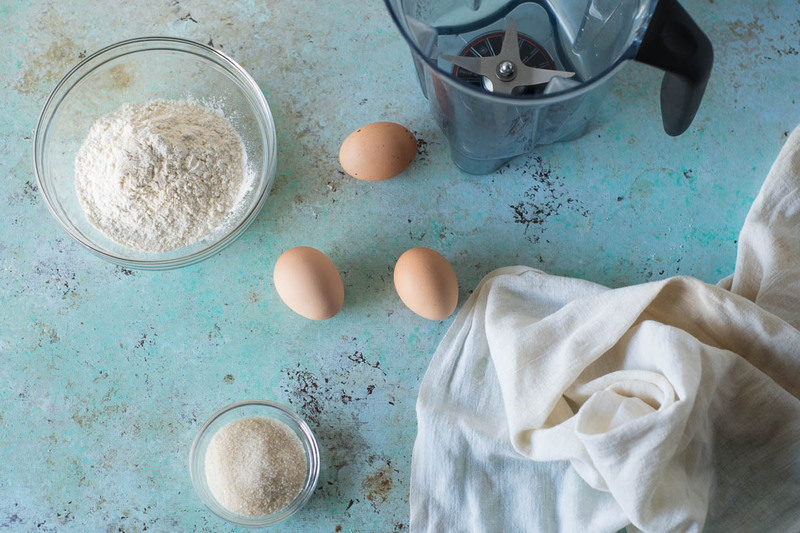 Mixing the batter in the blender helps to whip the eggs into a light and airy froth that gives it more loft in the oven (you can also do this with a stick blender in a deep container). 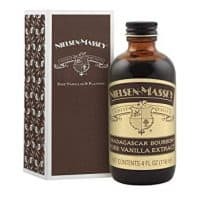 You can also mix it by hand, but you won't get the same amount of lightness and height (though it will still be delicious). Preheat the oven to 425°F. 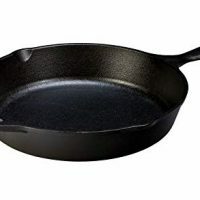 Place butter in an 8 or 10-inch cast iron (or other oven-safe) skillet and heat on the stove over medium heat until melted. Add the peaches in a single layer, then sprinkle the blackberries over the peaches, and let saute for a couple of minutes. Bake until puffy and golden, about 20 minutes. Oh my goodness that looks so delicious! I’ve been loving everything with peaches lately! Thanks, Liz! When peaches are in season I can’t resist them! I’m a sucker for anything in a cast iron pan. Desserts are so perfect for that, and yours looks so good! Thanks, Kylee! Cast iron pans get plenty of use in my kitchen! This is a great idea! I have made german pancakes with apples but never a blackberry peach combo. Thanks, Amy! I think these flavors work really well (though I love the classic apple too). This is a breakfast that would get folks out of bed. Nicely done!